Cut the beets into 1-inch pieces; reserve 1-inch piece for sauce. Pulverize Cocoa Puffs™ cereal using a spice grinder or small food processor. Combine the pulverized Cocoa Puffs™ cereal with the cocoa powder, salt and pepper. Place in small bowl; set aside. Place eggs in shallow bowl; set aside. Place cornstarch in another shallow bowl. Toss remaining beets in the cornstarch, shaking off any excess. 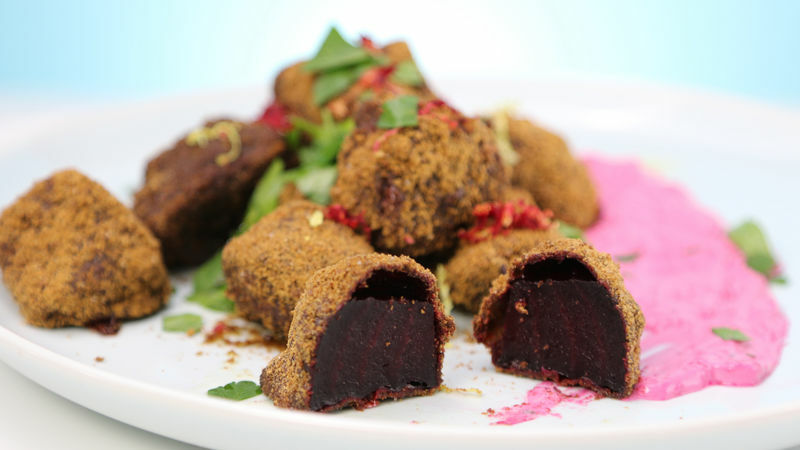 Coat each piece of beet in egg, and then dredge in the Cocoa Puffs™ cereal mixture. Place the coated beets on a greased cookie sheet and bake for 40 to 45 minutes or until fork tender. Meanwhile, in small bowl, combine the sour cream, 1 tablespoon olive oil, the thyme and salt. Grate the reserved piece of beet into the sauce; mix well. Keep chilled until ready to serve. To serve, place a spoonful of the sauce on each plate; pile the beets up on top of the sauce. Garnish with minced parsley, a drizzle of olive oil, a squirt of lemon juice and some lemon zest, if desired. These smell like chocolate cake when they are baking. I am pretty sure any kid would eat these without the garnish or sauce. No food processor? Place cereal in resealable food-storage plastic bag. Seal bag, and crush with rolling pin or meat mallet.